Customized classes for your healing journey. After years of placing yourself and your needs on the back burner, it is time to make YOU a priority. Do you want to return to the activities you once loved, but physically cannot enjoy anymore? Do you want to delve deeper into your own self-awareness and knowledge? Do you want to be part of a community that is supportive in your journey to better health? Each of my group classes is specifically tailored to the individual needs of the group; I gently and with compassion help you increase your quality of life through movement. Class sizes are limited to ensure a potent, powerful, and individualized experience. What’s holding you back from living the life you want? I use principles of kinesiology and biomechanics, and tools to improve overall nervous system health to guide you forward in your journey. I foster community, self-empowerment, and self-awareness; I will always respect your limitations while helping you progress. Expect something fun and new in every class, based on individual needs and goals. I know that you are ready to take control of your health. But you want to do it in a supportive community among peers, learning from a compassionate teacher who knows the best and gentlest way to guide you and your body. This is the environment for you. I am the teacher you need. If something doesn't immediately jump out at you below, send me an email to book a time to chat to discover if yoga therapy is right for you. You can expect to answer some questions, and of course ask some of your own, so I can best support your goals with a group class recommendation. I offer a number of different options for group yoga therapy, always focusing on the specific needs of each individual. Contact me here to discover which program is right for you. If you are wondering about the health of your pelvic floor, feeling disconnected from your center or feeling off balance in any way, this 6-week session is for you. This unique session will deepen your understanding of your internal structure of support, utilizing breathing techniques, therapeutic exercises and the tools of yoga including poses, mindfulness and meditation to begin to create a sense of a stable center. You will learn, and experience, how a body in balance invokes a core stability that increases energy, decreases pain and improves your overall sense of well being. 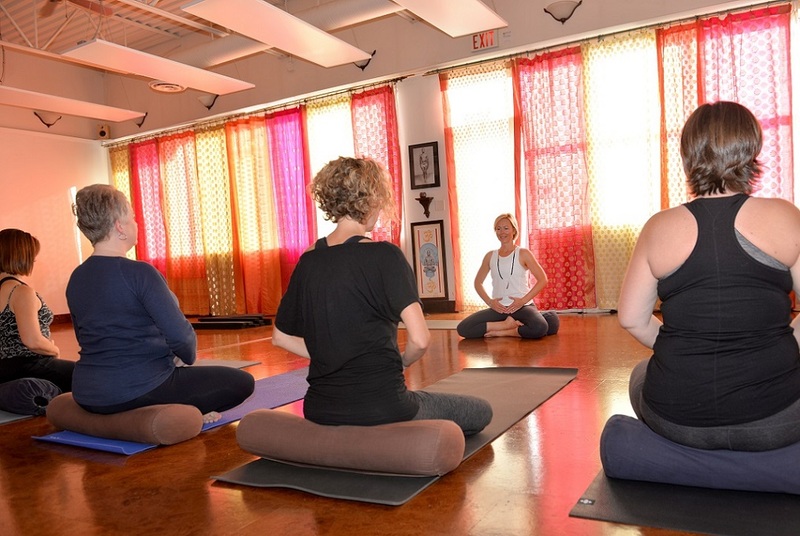 Each class will end with a guided, deep relaxation to reduce stress and improve vitality. In order to support home practice in between classes, I will be recording each session and providing downloadable audio files. In addition there will be an online hub to ask questions, watch short videos and share any comments you'd like to with your classmates. I will check the site daily and answer questions. Join me in Restore Your Core! Are you interested in the Restore Your Core class but live in Calgary? I have a solution for you! This unique session will deepen your understanding of your internal structure of support, utilizing breathing techniques, therapeutic exercises and the tools of yoga including poses, mindfulness and meditation to begin to create a sense of a stable center. You will learn, and experience, how a body in balance invokes a core stability that increases energy, decreases pain and improves your overall sense of well being. This course will primarily be delivered online. You will receive 7 weeks of audio and video content exploring pelvic floor health, breathing, pelvic awareness, spinal awareness, hip and shoulder mobiity and overall strength. There will be two video calls available to you to check in and have questions answered. At the end of the 7 weeks we will meet live for a one hour private session where we will bring it all together and create a movement practice that will serve you for years to come. All audio and video content will be made available for download. Register for the Online version of Restore Your Core! Taking our journey to better core-stability and health a step further, this series of online classes and 4 day intensive retreat will enhance your physical healing, your emotional well-being, and your understanding of Self. We start with the online Restore Your Core program and wrap up with a retreat in the beautiful Columbia Valley, with our home base in Invermere. The retreat will begin on the evening of Thursday, May 2 at 6:30pm, then run 10am-4pm on Friday and Sunday, with Saturday being a shorter day 10am-1:30pm to give you time on your own to integrate and have the afternoon to yourself. During the retreat we will explore pain science and how understanding pain will fundamentally change your experience of it. We will explore mindful movement, challenge old patterns and feel new possibility in suppleness, ease and strength. In addition there will be ample time spent out in nature - enjoying the beauty of the Columbia Valley in both time on your own and in community. Included in the 3 full days will be delicious catered lunches made with whole and nourishing ingredients. Monday we will have a morning practice and program wrap up. Spring time in the Columbia Valley is a magical time, in addition to all the above, you will witness the return of over 250 species of migratory birds to the incredible Columbia Valley Wetlands. Contact me for more information and registration details. This is filling up fast with only 3 spots left! Contact me for more details and registration information. Space is filling up fast - only 3 spots remain! For current or past yoga therapy clients, enhance your healing with customized attention. We will co-create a program to fit your own unique needs and desires. In this past this has ranged from a customized movement class for a couple, to year long programs including one on one time out on a paddle board, on the ski hill or running your favourite trails. If you can dream it, let's chat about a way to make it happen. Group classes are held in Invermere, BC at 1, 755 - 13 Street, unless otherwise noted. Book a free initial consultation with me to see which programs would best support your goals. Interested in wellness programs? Want to know more?